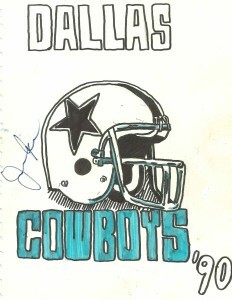 Leaving the Dallas Cowboys autograph event at Westlake way back in 1991, I caught Jerry climbing up the bleachers. He was sucking in the limelight and gleefully signing things for fans and children. He gave me his autograph on this drawing I did- which is laughable now looking back. Jerry purchased the team back in 1989 and immediately made waves. He fired longtime coach Tom Landry and brought in his own crony- longtime friend and former teammate at Arkansas, Jimmy Johnson, to coach the team. Johnson and Jerrah worked well together and had to take their lumps after making bold predictions of the franchise’s future winnings. Still after a 1-15 season, the team was able to right the ship slowly but surely. Jerry and Jimmy did well with in the draft, and made a killing on the Herschel Walker trade. The Cowboys won their first Super Bowl at the end of the 1992 season and followed this up quickly with another title in 1993. Jerrah made bold predictions about how he could win without Johnson, and Jimmy at that point had enough and was ‘forced out’. Jones brought in Barry Switzer to coach the team. Switzer indeed did bring the Cowboys another title after the 1995 season. Switzer himself left the team after he was busted with a gun in his bag at the airport. The team has gone through various other coaches since then: Dave Campo, Chan Gailey, Wade Philips, and Jason Garrett. Jones has received more and more criticism as the year goes on, much of it warranted. He does have the title of General Manager, and is one of the most hands on owners in all of sports. His appearance has also changed with more and more plastic surgery, and his frequent appearances on TV and in commercials don’t help either. Many fans feel that Jerrah only cares now about making money, charging fees to take tours off of the new stadium while the team is mired in mediocrity, and liken him more and more to the late Al Davis everyday- an owner that took Jones under his wing early on. Jerry’s strength lies in his business skills and acumen when it comes to doing what’s best for his franchise. He’s been able to get a new, amazing stadium built in Dallas, leveraged contracts with vendors to identify with the Cowboys’ brand, and mentored a lot of players with how best to use their money after retirement. Although I am hard on him, admittedly, I must give credit where credit is due, and it is probably on the merit of the above, that he was inducted into the Pro Football Hall of Fame 2017 class as an owner. Jerry is also quite good to fans and honors all TTM requests through the Cowboys organization.